Spider-who? Bat-wha? Neither the web slinger nor the Dark Knight can stand up to the superhero movie to end all superhero movies that is “Marvel’s The Avengers.” As much as the word is overused, director Joss Whedon has truly assembled an action-packed masterpiece when it comes to men (and women) in tights saving the world from super villains. And though Whedon can be credited for flawlessly directing the best of the series of films that began with “Iron Man” in 2008, it’s the superstar cast of “Marvel’s The Avengers” that ultimately proves to be most fulfilling, with no one big name out-starring another. Somehow the snark of Robert Downey Jr.’s Tony Stark, the brutish eloquence of Chris Hemsworth’s Thor, and the classic heroism of Chris Evans’ Captain America all remain intact in this film, as strongly portrayed as they were in their previous starring roles in “Iron Man,” “Thor,” and “Captain America: The First Avenger.” There are indeed multiple leading roles in “Marvel’s The Avengers,” but like the team dynamic of Avengers themselves, no one overshadows another. Though Stark’s frequent one-liners do have the power to leave the viewing audience in shambles. 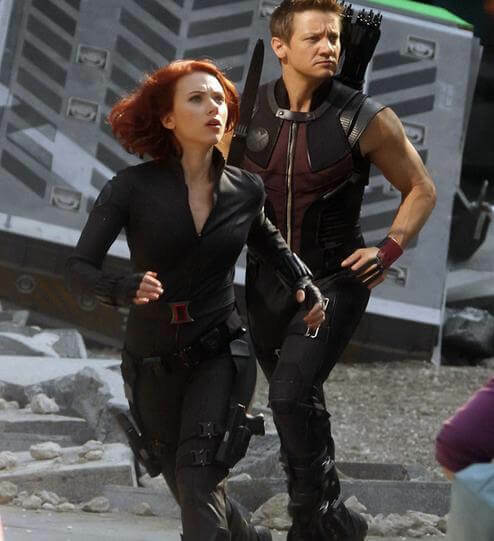 Jeremy Renner was previously seen in “Thor” in a role that led to his appearance as Hawkeye in this new film, and though his character shows off plenty of super bow-and-arrow skills, his appearance in “Marvel’s The Avengers” is ultimately less interesting than the superheroes he surrounds himself with. Likewise, while Scarlett Johansson provides some much-needed femininity to the otherwise all-male group in her role as Black Widow, her shady past that’s often alluded to is never intriguing enough to care. She’s enjoyable to watch, not only for her looks but also for her talents to best even the biggest baddies she comes across, regardless of their size compared to her relatively small figure. But it’s the biggest good guy of them all that elicits the biggest reaction, as “Marvel’s The Avengers” is the film where they finally got the Incredible Hulk right. With huge on-screen moments both shocking and hilarious, the Hulk draws the most laughter and cheers throughout the film, appearing only in the necessary small doses to make the character enjoyable to watch. That was the downfall of 2008’s “The Incredible Hulk,” giving far too much screen time to a big green guy that’s relatively mute. He’s a one-dimensional character by design, used perfectly in this film to do what he does best: smash. 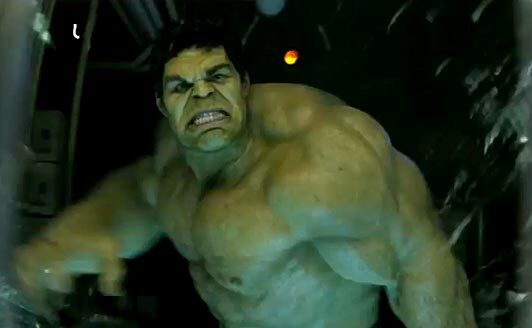 Mark Ruffalo successfully portrays the internal struggle of Hulk’s human form, Bruce Banner, but it’s Hulk that steals the show. 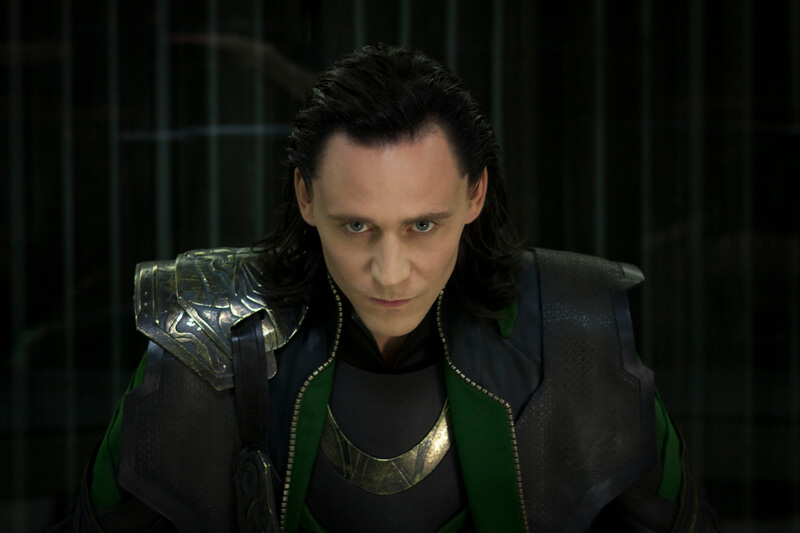 The Avengers would be nothing without a super villain to battle and though the character of Loki was rather weak and entirely too whiny in “Thor,” he returns for this film as a worthy adversary to the team of superheroes, backed by an army of mysterious otherworldly creatures. Tom Hiddleston is a notch or two below over-the-top in his portrayal of the wicked brother of Thor, which hits just the right notes to make audiences hate him, and yet find him enjoyable to watch. Fans of Joss Whedon’s previous work will find plenty of his style scattered throughout the film, but fortunately his food-in-the-mouth dialogue only creeps up occasionally. It worked well for teenagers in “Buffy the Vampire Slayer” but not so much on superheroes. Occasionally awkward dialogue aside, Whedon and his team successfully immerse the viewing audience in what is essentially one long action sequence, rarely offering viewers a chance to blink. “Marvel’s The Avengers” unfolds nearly in realtime, bringing everyone along in the battle to save the Earth. It’s an intense two hours, masterfully assembled (there’s that word again) to never become cumbersome, despite the near-constant onslaught of action. In other words, it gives every superhero fan exactly what they’ve always dreamed of: superheroes being superheroes to the best of their abilities. And Whedon fortunately doesn’t ever suffer from Michael Bay syndrome, always carefully placing the camera where the action can unfold in clear view on screen, rather than forcing viewers to guess what’s happening from far too many close-ups. Shots from within busted New York taxis, peeking around corners of half-demolished buildings, or hiding behind rubble watching via a window reflection are a few of the unique ways viewers are immersed into the scenes. Though I’m not personally a comic book fan, I was able to perfectly follow the entire story presented in “Marvel’s The Avengers,” never confused by which character was which and what their abilities were. Of course, it greatly helps to have seen all the films that lead up to this newest installment, including their post-credits scenes. And “Marvel’s The Avengers” is no different in that respect. The film wraps up neatly in the end but does leave the door wide open for something new by way of a tag prominently featured during the credits. Admittedly, that bonus at the end is the only part of the movie I needed explained to me afterward, though longtime Marvel fans should “get it” right away. Update: Apparently there is an extra, extra scene at the end of the credits in addition to the mid-credits one described above. It wasn’t attached to the press screening of the film last week, but its inclusion sounds like a good excuse to see the movie again. Visually, “Marvel’s The Avengers” takes full advantage of the 3D format, with some of the most stunning single 3D shots since “Avatar.” But because the film is so entirely packed with quick cuts and fast-moving action, eye strain and headaches are a very real possibility when watching in 3D. The impressive camera work floats seamlessly between the film’s stars, giving ample screen time to everyone’s favorites, highlighting their finest moments. 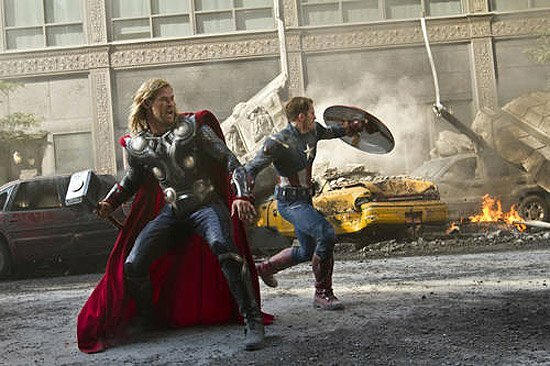 “Marvel’s The Avengers” has often been described as the “best superhero movie ever” and that’s exactly the thought I had when the credits began to roll. Not only is it a perfect culmination of a series of mostly-excellent films, but it’s also a wonderfully entertaining movie unto itself. Longtime comic book fans will praise this film for years to come while everyday moviegoers are in for a treat when they -sigh- assemble in theaters this summer. 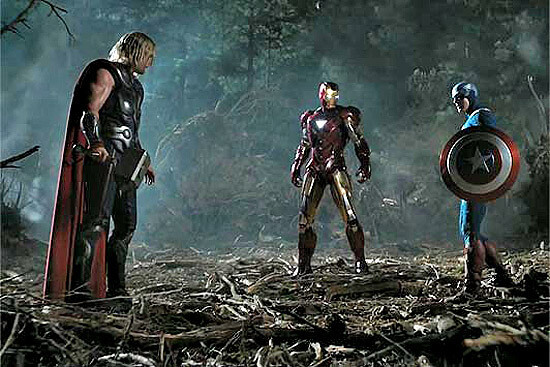 “Marvel’s The Avengers” hits United States theaters on Friday, May 4, 2012. I know who Batman and Superman and Wonder Woman are — but I had never heard of The Avengers until a few months ago. I was surprised to learn they have been around since the 60s. I think they are friends with Spiderman and the The Fantastics, whom I have heard of. I didn’t see the Iron Man or Thor movies and didn’t even hear about a Captain America movie. I guess I need to pay attention to this stuff more now that Disney owns Marvel. It could be a regional thing. I know that in the UK, THE AVENGERS name is more associated with an unrelated TV show. So I could imagine these Marvel characters possibly not being familiar to some people. I can’t wait! I’m doing the marathon tomorrow! All 6 movies in the theater!! Super pumped now!! Thanks for the review. Although I had every intention of seeing this movie no matter what the reviews said, now I am just that much more excited to see it. Fantastic review, Ricky. I’m going to see it tomorrow night at midnight and I am THOROUGHLY looking forward to it. Reading reviews that praise the film are so great and knowing that I’m going to see an amazing superhero movie is such a good feeling. Plus, this being Disney’s first Marvel movie, it’s a big step up for them already! 3D is not necessary but does enhance some shots. My eyes grew tired of the 3D by the end of the film because there are so many fast cuts and action scenes. I am a die-hard DC fan, so when a group of co-workers from Dish invited me to watch The Avengers I thought, “no problem.” I was blown away with how much fun this movie is and that it’s still a phenomenal, action thriller. I even went as far as watching the Avengers cartoons on Dishonline to better understand this newly introduced superhero team, and I’m liking them more and more! I’m looking forward to the Dark Knight, but now that I’ve seen The Avengers, I’m having my doubts about Dark Knight being the best movie of the year.